One of the desserts we’re making for Easter is a Limoncello Tiramisu. Lemon is the perfect Springtime flavor, and something a bit ooey and gooey is a nice reward for being so good the past nine months. This is the type of dessert that really reminds me of my mother. I don’t think she ever made an actual tiramisu, but she was great with puddings and contrasting textures and flavors – she just knew how to do it. And while I may not be as gifted as she was in the making of them, I definitely inherited her love of them. 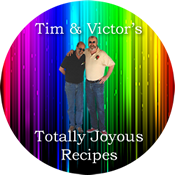 There is a method to my madness – and, fortunately, it seems that I did not screw them up! Making them was a bit of as challenge because I didn’t have a plain 1/2″ icing tip, so I had to fudge things a bit. And… the batter is really loose. But… they came out! I was even a good boy and drew my 4″ lines on the parchment paper to make them reasonably even. Line two baking sheets with parchment paper. Prepare a pastry bag fitted with a round 1/2 inch tip. In a medium bowl, beat the egg whites, 50 grams (1/4 cup) of sugar and 1 teaspoon of lemon juice until stiff peaks form. In another bowl, beat the egg yolks with the remaining sugar, lemon zest, vanilla extract, 1 teaspoon of lemon juice and salt until thick and light yellow. Sift the flour and potato starch over the egg mixture and gently fold it in with a rubber spatula until smooth and well combined. Transfer half of the batter to the prepared piping bag. Pipe the batter into lines about 10 cm (4 inches) long, keeping distance between them. Sprinkle the cookies lightly with icing sugar. Let them rest for about 5 minutes and sprinkle again with icing sugar. Place the baking sheet in the oven and bake for about 15 minutes until lightly golden. 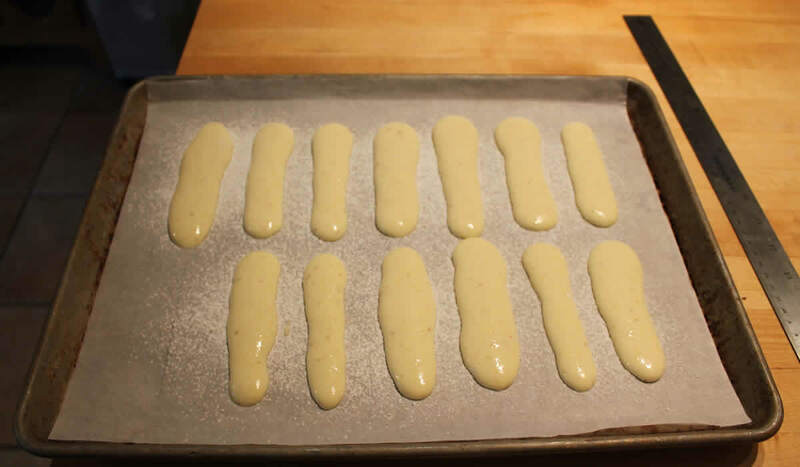 Let the ladyfingers cool for a few minutes then release them from the parchment paper, with a flat spatula, while they are still warm. Serve the savoiardi immediately or store in an airtight container up to 2 weeks.